Fri., April 21, 2017, 10:36 p.m.
What happened: Oakland Athletics left-hander Sean Manaea limited the Seattle Mariners to one run over six innings on five hits and three walks with six strikeouts and the A’s beat the M’s 3-1 on Friday. It was another listless and lifeless performance by the middle of the Mariners order, as the 3-6 hitters – Robinson Cano, Nelson Cruz, Kyle Seager and Taylor Motter – combined to go 2 for 13 with four strikeouts and strand seven. Cruz did walk twice, and almost inexplicably stole a base. But one of the two base hits the group did manage was just a bunt against the shift by Seager. Overall, the team went 0 for 7 with runners in scoring position and left seven. Starter Hisashi Iwakuma (L. 0-2) was serviceable – he gave up three runs on five hits and four walks with three strikeouts over 5 1/3 innings. But he gave up a pair of homers – to Trevor Plouffe and Yonder Alonso – and these days serviceable pitching isn’t good enough to carry the M’s, especially on the road, where the offense has been moribund. OF Guillermo Heredia led off the game with a single, then was promptly picked off when he took off on first move. Not really how you want to start things off. In the second, Nelson Cruz led off with a walk and Kyle Seager bunted against the shift for a base hit off the lefty to put two on with no outs. But Taylor Motter bounced into a 5-4-3 twin-killing and Danny Valencia watched a changeup for strike three. Heredia singled with two outs in the third and scored on Mitch Haniger’s triple, which stayed just inside the bag at third. M’s wasted another lead-off man reaching in the fourth. Cruz drew another walk, but Seager struck out behind him. Motter forced Cruz at second on a fielder’s choice, but then stole second for a spark. But Valencia then grounded out to end the inning. Iwakuma finally wore down. He hung a backup breaking ball that got too much of the plate against Trevor Plouffe, who lofted it to center just out of reach of Jarrod Dyson’s leap at the wall for a solo homer in the fifth to tie the game at 1. Then in the sixth, Yonder Alonso crushed a fastball for his third homer of the season, then Jed Lowrie doubled and went to third on a groundout. Manager Scott Servais called upon James Pazos, but he gave up a medium-deep sac fly to right and Lowrie easily beat the throw to make it 3-1. Valencia gave one a ride in the ninth, but it died on the track in left and Kris Davis made a quality running catch before crashing into the padded wall. There’s no easy way to say it: the M’s own the worst record on the road (1-8) in the majors. They’ve now lost the first two of an 11-day, 10-game road trip so it’s not going to get any easier. Simply, they have to figure out a way to generate offense away from Safeco in the next week or the season could be lost before it really even begins. To add insult to Seager's near miss home run that he was talking to himself about, Nelson Cruz just stole a base. Steve Cishek, on a rehab assignment with AAA Tacoma, threw 20 pitches (10 strikes) in 2/3 innings and allowed a hit and two walks, while picking off a runner at first…Guillermo Heredia went 2 for 4 with a run…The Mariners turned three double plays…Nick Vincent tossed 1 1/3 scoreless innings in relief. Seattle Mariners (7-11) vs. Oakland Athletics (9-8) at 4:05 p.m. at Oakland Coliseum. LHP Ariel Miranda (1-1, 3.06) vs. RHP Jharel Cotton (1-2, 5.40). The middle of the lineup hasn't done well on the road just yet, and Scott Servais is starting to point that out – if not pointing fingers. … Before the game, the M's made a change to the bullpen, with hard-throwing Dan Altavilla sent back to Tacoma. … The A's will be without one of their big bats for a while, but are still rolling along. 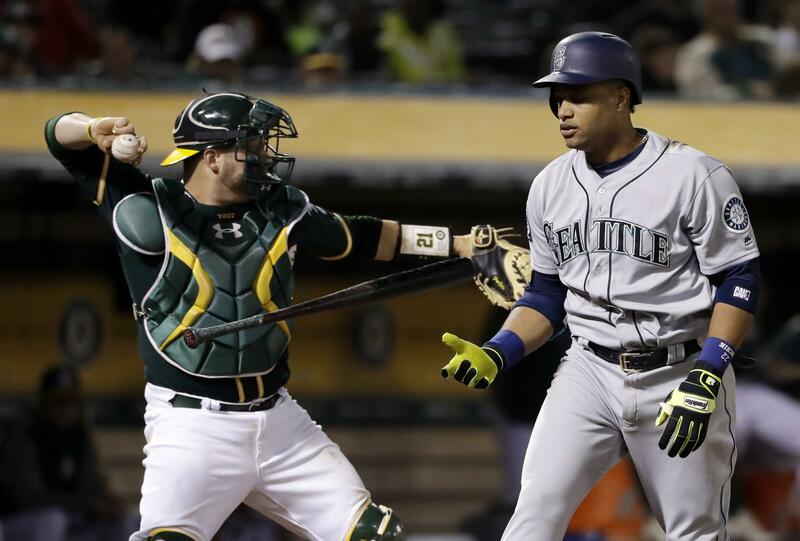 … The loss dropped the M's into the American League West cellar. Published: April 21, 2017, 10:36 p.m.